Jean-Charles Brosseau, milliner and creator of 1981’s still popular Ombre Rose, has recently released a trio of men’s fragrances: Thé Brun, Atlas Cedar and Fruit de Bois. Of the three, the one I was most anticipating is Thé Brun or Brown Tea, created with perfumer Pierre Bourdon. 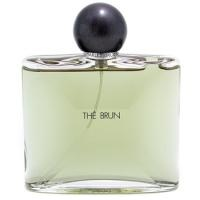 Thé Brun has notes of bergamot, fruity notes, green leaves, lavender, violet, spices, cumin, jasmine, orange blossom, lapsang tea, palisander wood, powdery notes and musk. As a huge fan of tea fragrances, it was with great excitement that I tested Thé Brun, and I definitely wasn’t disappointed. This magical creation lies somewhere between Comme des Garçons Leaves Series: Tea and Comptoir Sud Pacifique’s Ecume de Thé, and while not entirely a new concept, it does seem to cover some new ground. Opening with a smoky tea accord accented with spice, citrus and wood notes, Thé Brun’s composition is well-blended and no single note really prevails. Whereas Comme des Garçons’s Tea gets weighed down by dark wood and leaf notes, and Comptoir Sud Pacifique’s Ecume de Thé opens with a citrus burst, Thé Brun is a straightforward rendition of a pot of Earl Grey — slightly sweet, slightly aromatic, slightly smoky and completely intoxicating. The scent is definitely unisex and quite easy to wear. Fans of black teas will delight in the darker basenotes while those wanting something lighter will appreciate the subtle sillage of the scent. Development is minimal and after an hour or two, Thé Brun settles and stays close to the skin. I’m surprised this one was released as a men’s scent and not as a unisex scent, but as there have been very few tea scents marketed exclusively to men, perhaps this is a new path. It may seem like odd timing as tea scents seem to be slightly passé, but hey, L’Occitane is still churning them out (a new scent arrived last month: Green Tea and Jasmine). Overall this is a beautiful fragrance; I’m looking forward to wearing it on a crisp autumn day. Testers of Thé Brun are available for under $25 at parfum1; the fragrance is also available at perfumebay and at escentual in the UK. I want!! Oh, how I want! Marlen, have you tried the other two? *Please*, please report on those too! I smelled this trio of scents last August at Roja Dove's Haute Parfumerie and the The Brun was by far my favourite of the 3. Stay tune for a review of Fruit de Bois next week! But honestly, for less than $25 a bottle, its worth the splurge! This is, by far, the best of the trio. It's also one of my favourite tea scents. It's smoky and a little bit 'dirty.' It's also full-bodied, and has decent longevity. I prefer it to Bulgari Black, which now seems weak-kneed to me (has it been re-formulated?). This is one I will always return to, no matter how many bottles I have on my shelf. Marlen is no longer here to answer you, and unfortunately, I've never smelled the The Brun! Wish I knew where I could find a tester as I'm not going to buy it unsniffed. I would not prefer it to Bulgari Black, I adore both. Black does not smell any different to me today, then when it first came out, so I do not think it was re-formulated, but …. The Brun IS strong, but just right. Like asking black tea lovers if earl grey is a strong tea. It’s not by their standards, but unaccustomed might find it a bit strong on first sip. In case you’d like a sample, I can mail it to you, just tell me where. That’s very kind, but I’m drowning in samples already — think I will let this one pass! tried it again yesterday. One picture came to my mind. An achingly beautiful scent. Loely as an antidote to some of the heavier fragrances that I love. Beware those who dismiss it as weak juice – it goes through several stages as it develops, in the end staying as a skin scent, but with warm animalic body scents that cling. The tea is beautifully smoky and weaves in and out as the scent develops. This is a sophisticated Keemun, not a full on birch tar laden Lapsang Souchong.